A new high grade lithium discovery comprising of 7,569 hectares land in 3 mining licenses. Located to the north of Salar de Antofalla owned by Albemarle and Ultra Lithium. 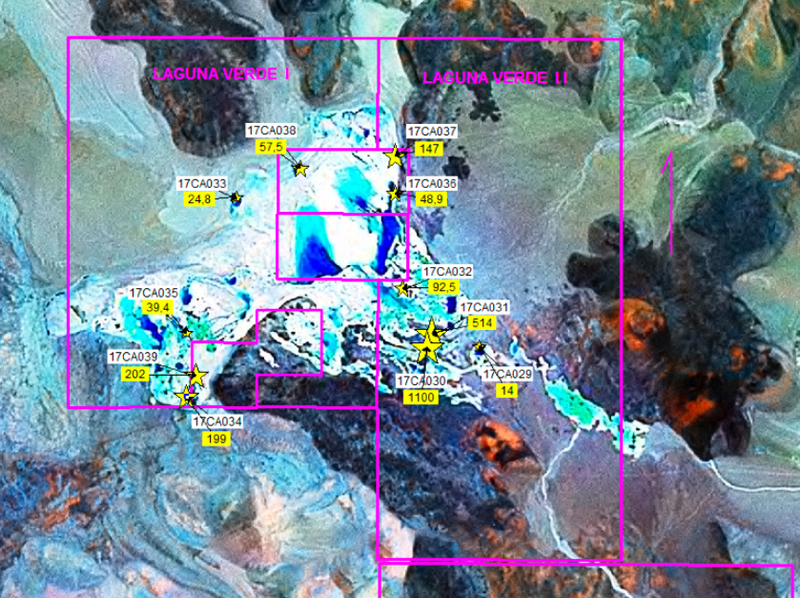 The mining licenses Laguna Verde I and Laguna Verde II contain approximately 3,000 hectares of salar in which surface water is detected in the centre with high salinity probably contributed through faults and shearing structures. Historically, in Laguna Verde I and Laguna Verde II hand exploitation of Sulphides was in operation. These historical operations cover a salar of 1536 Has, with numerous lagoons in its interior. The alluvial fans surrounding the salar, would seem to bring fresh wáter but salar is interpreted to continue below the freshwater fan material. In particular, the higher salinity and density seems to be associated with lagoons with orange water. Possibly the salinity is associated to an active hydrothermal conduit that would contribute salts from fractures in the interior of the lagoon. Some of the evidence of hydrothermal activity are circular depressions and altered volcanic rocks, associated with the brackish areas. 2017 sampling results indicate lithium values in the range of 14 ppm to 1,100 ppm, potassium values 262 ppm to 14,100 ppm, magnesium 87.9 ppm to 1900 ppm with Mg/Li ratio of <1 to 13. Further review of the assay results by the Company’s technical team indicates a strong correlation of lithium values with brine density measured in the field. The other controlling physical parameters are pH, total dissolved solids (TDS) and the influence of fresh water from alluvial fans in the catchment area of Laguna Verde Salar. 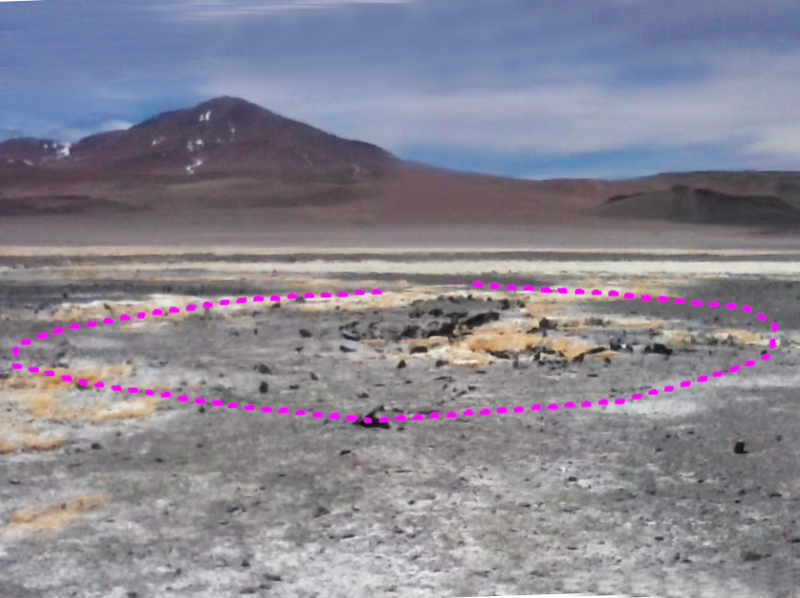 ULI’s working model for exploration is that the potential source of lithium in the lagoon and subsurface is hydrothermal movement of lithium through a system of faults. A northwest–southeast running fault structure has been identified in the field and on satellite images which is considered a possible source of lithium concentration in this brine. This interpretation of the results will be used as a guideline for future sampling and testing work. The Company’s workplan for this area in 2018 includes ground geophysical surveys, constructing evaporation ponds to produce lithium concentrated salts, and diamond drilling. To view the complete September – October 2017 Sampling Data for our Argentinian Lithium Properties – click here.